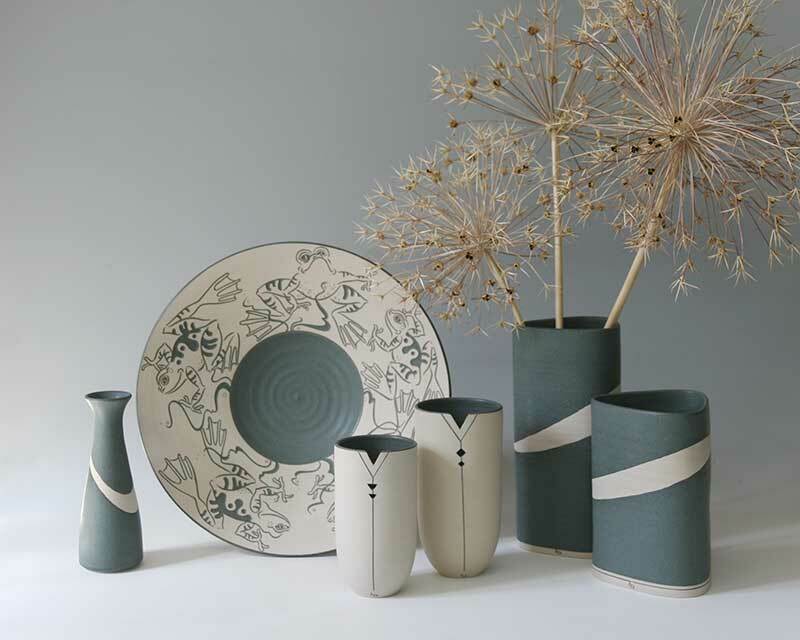 Louise Darby has been a professional potter since graduating from Loughborough College of Art and Design in 1978. 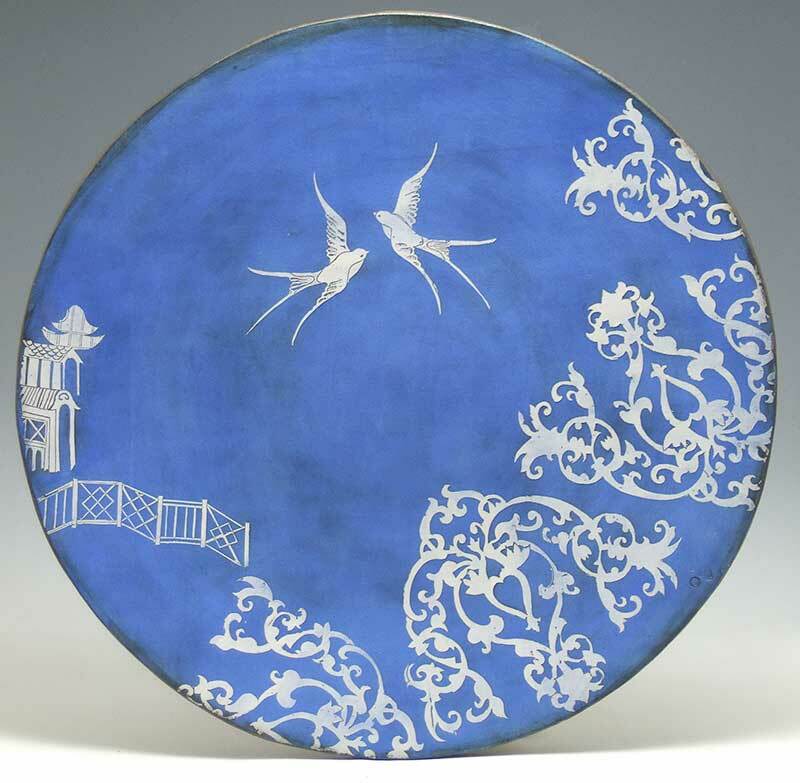 In 1983 she set up her own studio, specialising in finely thrown stoneware and porcelain ceramics, making the techniques of incising and carving very much her own. 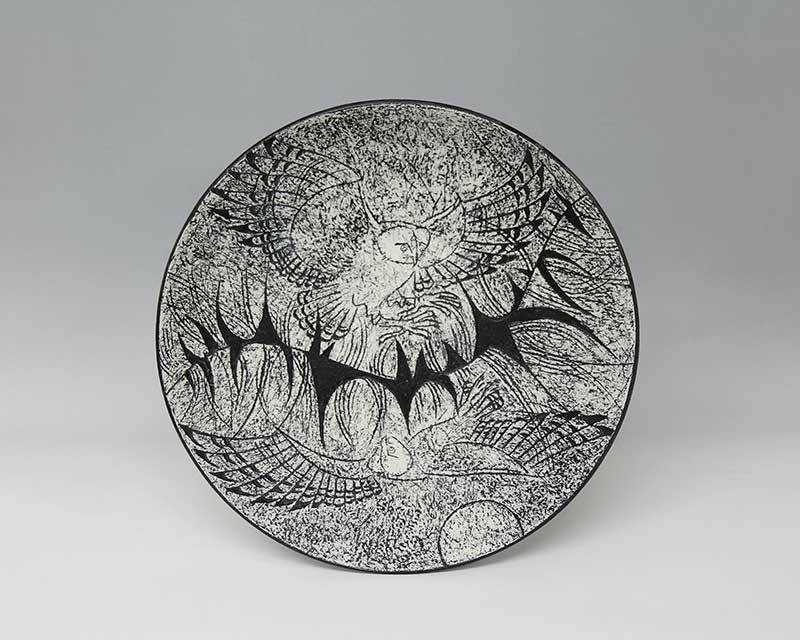 Louise draws stylised images freehand into the leather-hard clay and, after biscuit firing, inlays them with glaze by pouring, dipping, scraping and sponging, before the glaze firing to 1280ºC in a ceramic fibre gas kiln. 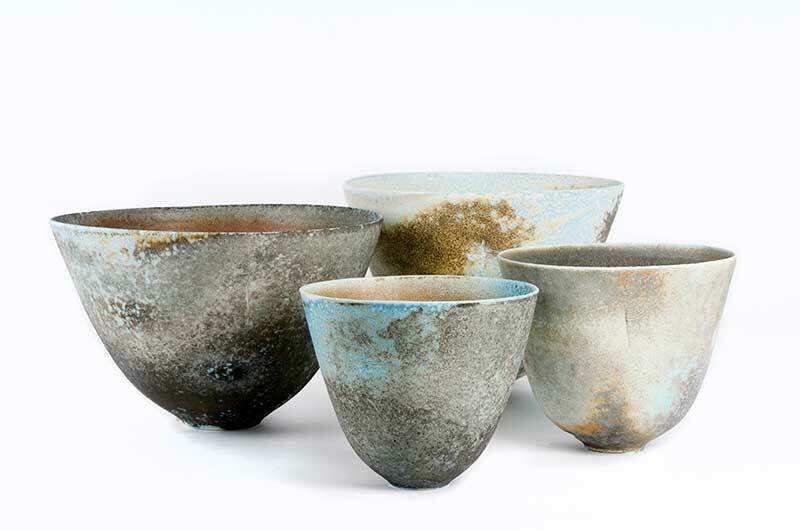 In contrast to these animated pieces, are those with piercing, textures or simply glazed; all with rich satin-finish glazes she has developed herself. 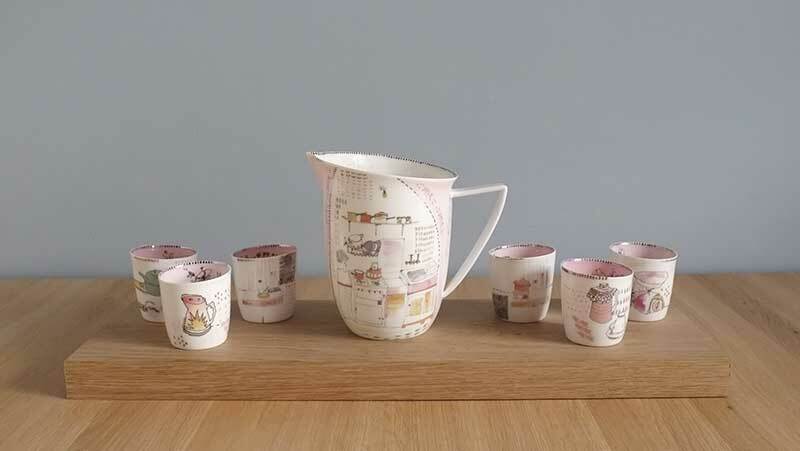 Achieving fine craftsmanship, with lively drawing skills, attention to detail, surprise and humour, and a sensitive balance between clay and glaze surfaces, Louise’s work is pleasing to the hand and satisfying to the eye, and part of private collections worldwide. 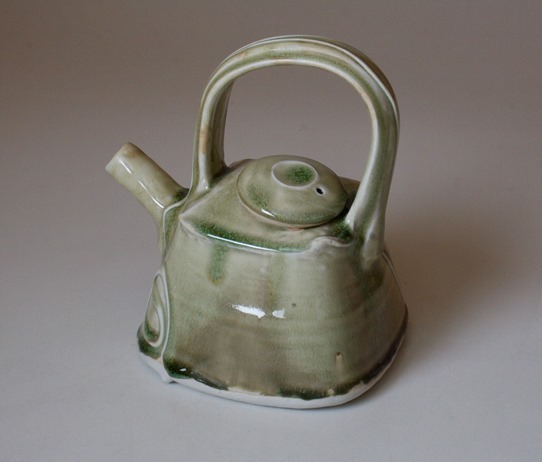 A professional member of the Craft Potters Association, over the years Louise has sold through major galleries and has taken part in the best UK retail art & craft events. She now creates her own group biannual exhibitions at her workshop, inviting fellow professional artists working in other media, selecting those whose work share something of her inspiration, attention to detail and technique - combining traditional skills with contemporary flair. Louise works independently at Clay Barn, where she has a small well-stocked showroom and welcomes visitors – by appointment please. There is a humour in my work, an element of the ridiculous, but also an element of sophistication. My work emulates this coupling of humour with sophistication and tries to exist where these two meet, creating an elegant style that occasionally teeters on the edge of vulgarity. 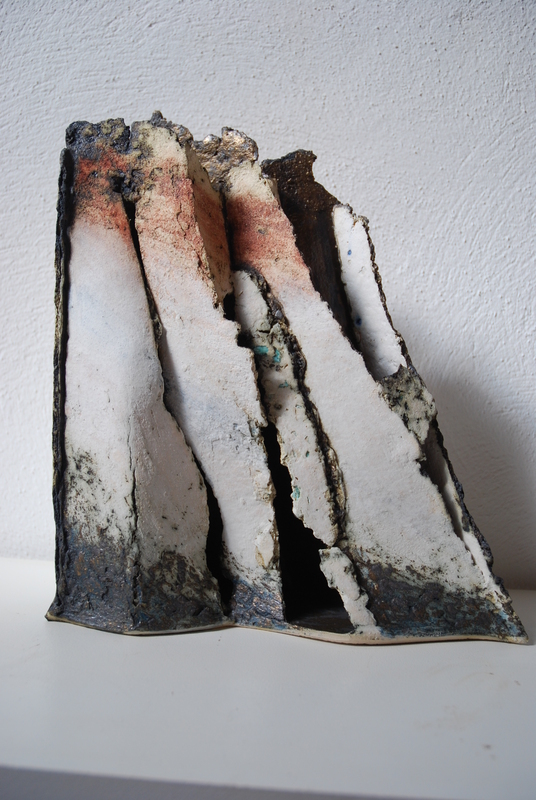 The exploration of clay is probably the most important aspect of my work. 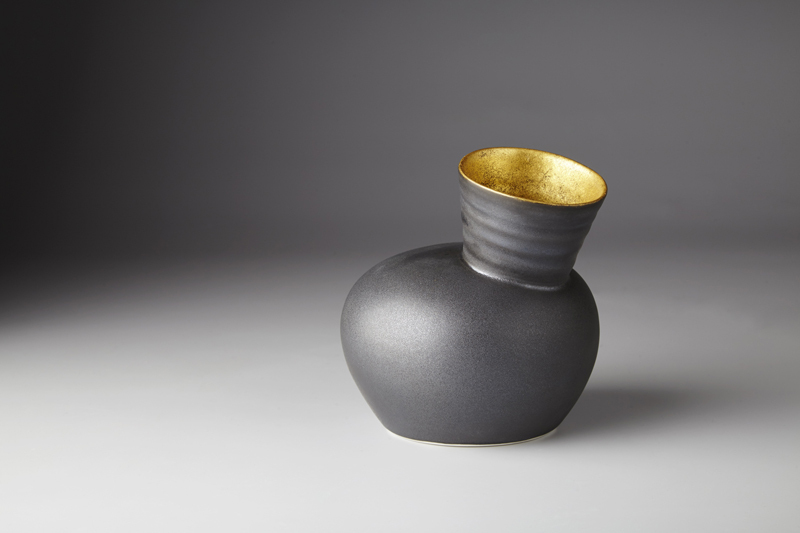 As I see it, an object I have made is best when it crystallises the liquidity of clay in the final ceramic. 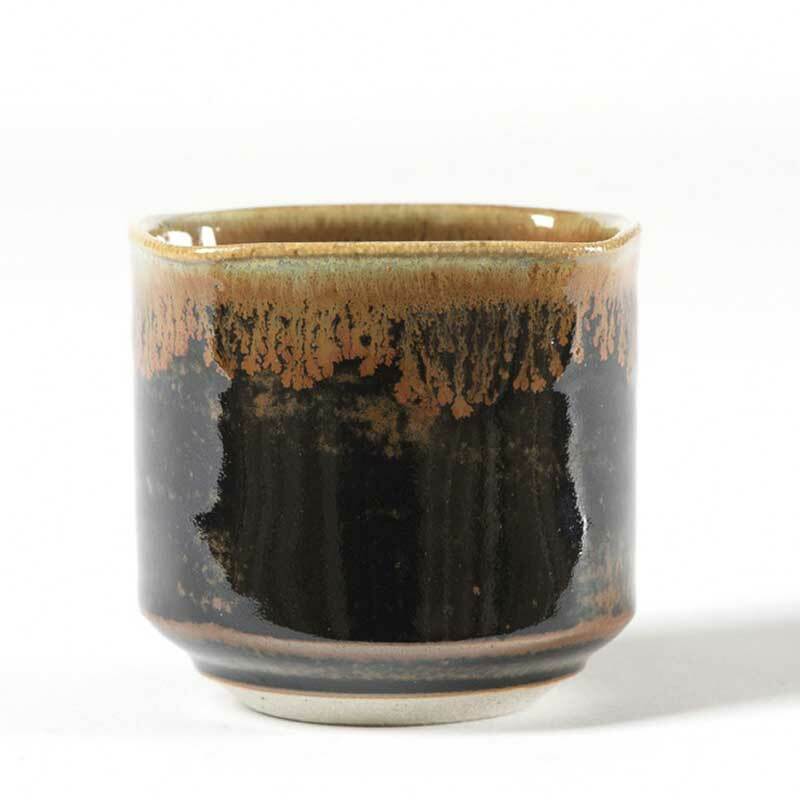 The glazes I use are chosen because they enhance this sense of water and flow that is present in the object’s making on the throwing-wheel. 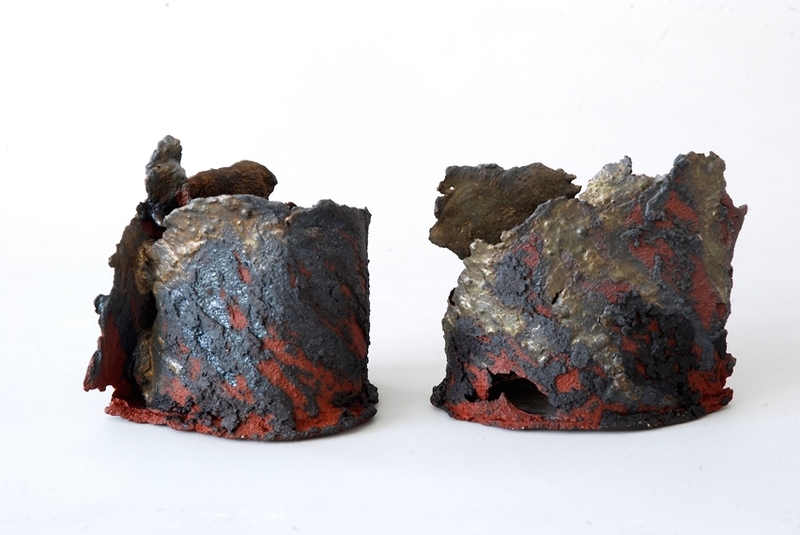 This work is not an allegory and does not have a scripted narrative; it is instead the result of an intuitive enquiry into clay, using a visual language that is gradually unfolding with each piece made. 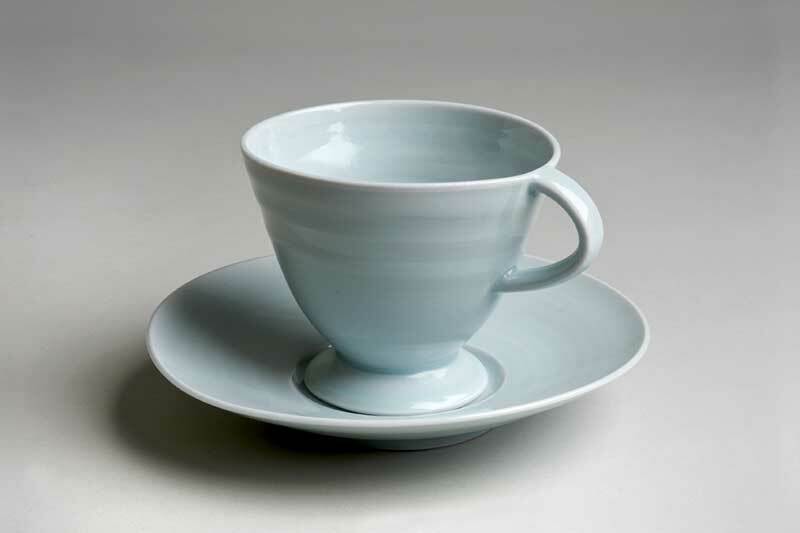 I predominantly create decorative bone china tableware appropriating factory production techniques by hand. 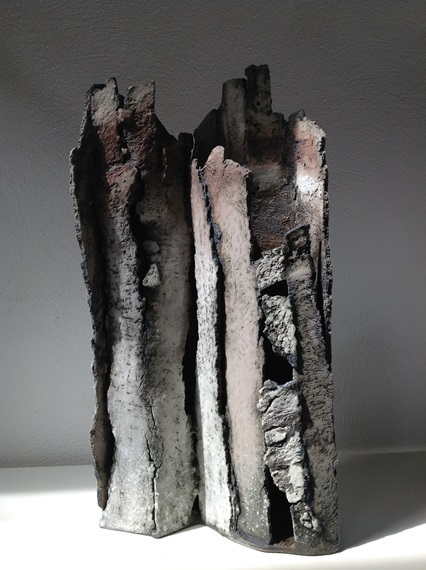 These techniques have been honed from studying ceramics at Cardiff and Stoke-on-Trent and through my own studio experiments. Typically, the work is characterised by forms with slanted openings, coloured surfaces and vibrant illustrations which are hand-drawn, processed and applied. 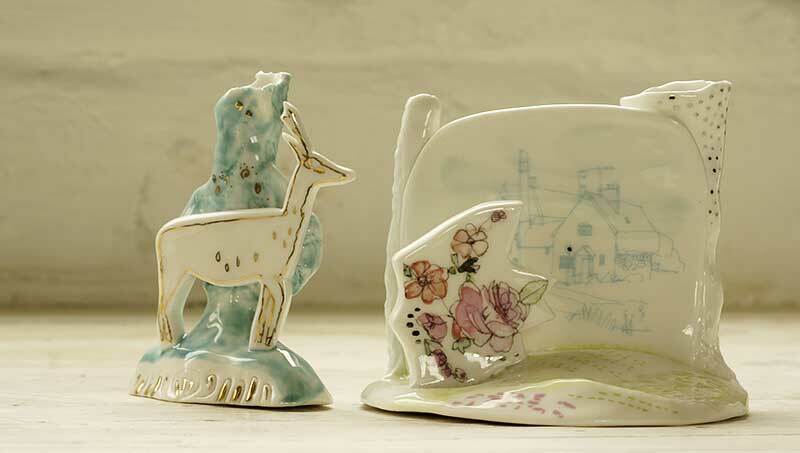 Each piece is fired five times: biscuit firing at 1240°; glaze applied and fired to 1120 °; a layer of coloured glaze; then decorating the surface with a combination of screen-printed and digital transfer; with the final firing happening after lustre is applied onto the designs. I have been practising as a ceramic artist for over 12 years, working from a studio co-operative - Fireworks Clay Studios - in Riverside, Cardiff with recent projects involved in pushing the creative application of bone china by modelling small figurines and experimenting with making lithophanes. 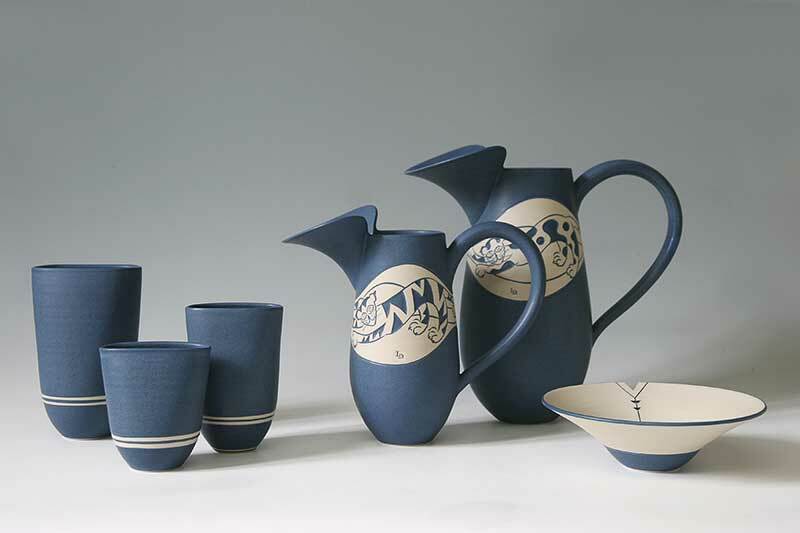 I studied ceramics at Harrow (1986-88) and Cardiff (1988-1990). Patia was invited by Mick and Sheila Casson to Wobage after graduating in 1990. 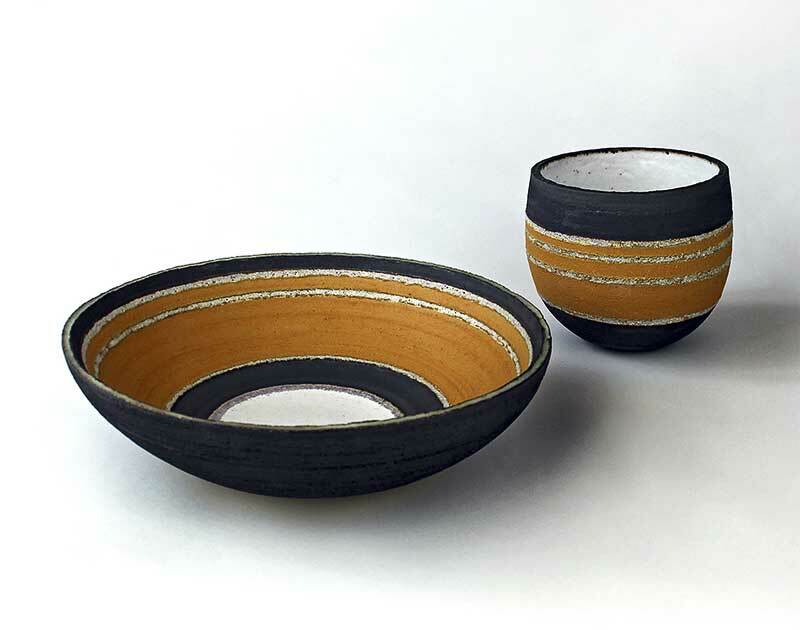 Within the dynamics of shared kilns, materials, work and teaching spaces, Patia has her own workshop where she makes slip decorated earthenware alongside her high-fired ash and feldspathic glazed porcelain. Patia teaches on a program of summer courses and evening classes from the Wobage throwing studios, alongside colleagues Jeremy and Petra Steward. Patia has exhibited in both the UK and Japan. 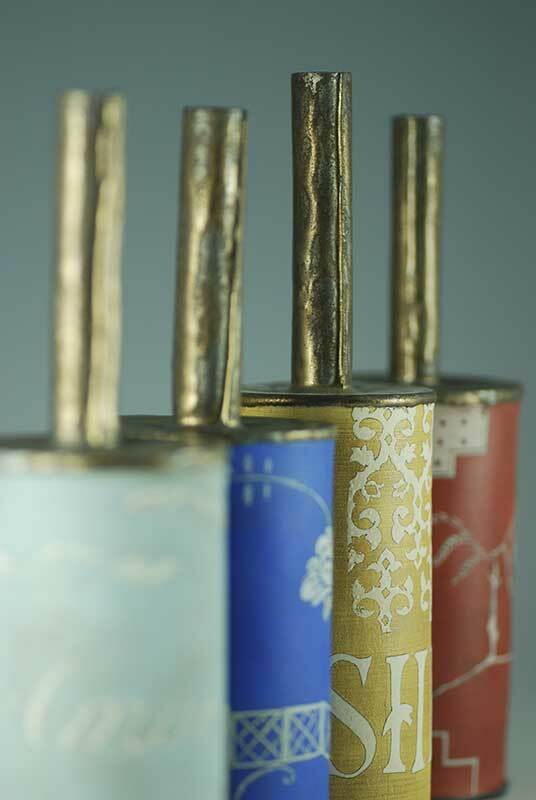 Wobage Makers Gallery is open Thursday - Saturday 10am -5pm. Other times please telephone first. 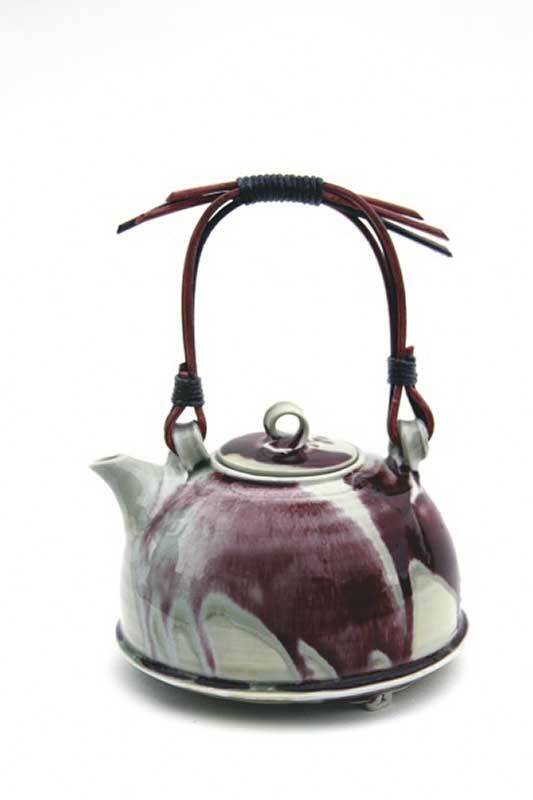 In the 1970's I came from New Zealand, where a strong and active movement of studio pottery dominated the crafts. Having dabbled in ceramics before leaving, with the intention of studying the harpsichord and organ at Trinity College of Music London, the desire to return to working with clay was still very strong. 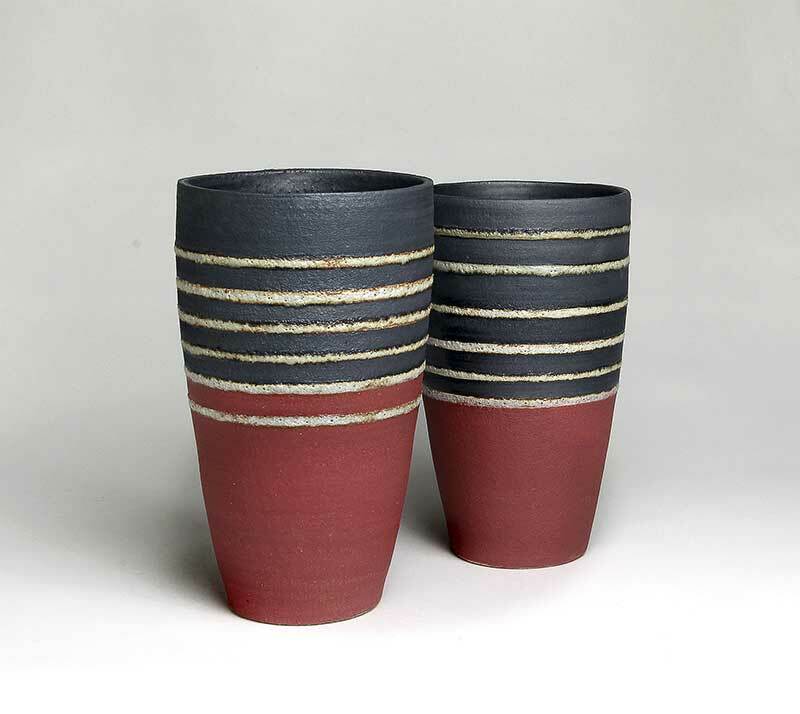 Now having graduated from Goldsmiths' College, my work in ceramics has very strong parallels with my work as a professional musician. While at Trinity College I was drawn to the music of the Baroque period. With baroque music, the form is usually very simple: a theme, containing just a few notes, is embellished or decorated to enhance the simplicity or to sustain the melodic line. Often the composer determined the structure in terms of chords, and it was up to the performer to extemporise his ideas, emotions and feelings with embellishments. I have used porcelain clay to express these feelings. 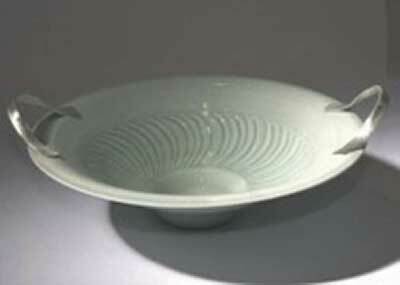 A simple bowl form is made and is then altered to create an impression of movement. Isabel throws her stoneware and porcelain pots on an electric wheel and they are reduction fired in a gas kiln to 1280 degrees. 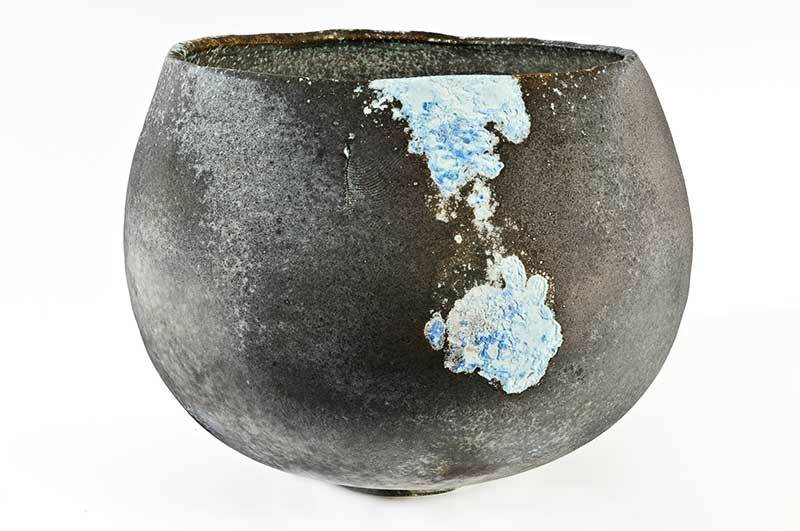 Her love and appreciation of natural things such as lichen, moss, the patterns that water makes and stonemason’s chisel marks on Yorkshire barns comes through in her glazes and sgraffitto mark making. 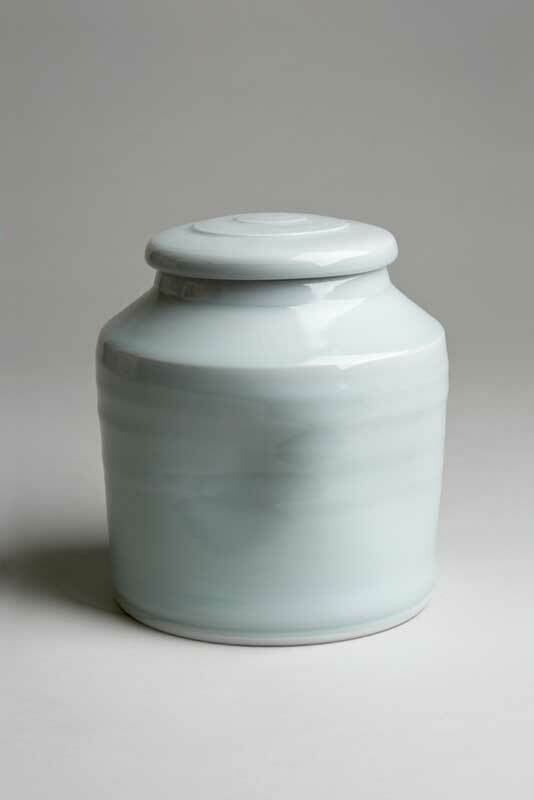 Her pots are made to be used and cooked in for both everyday use and for special occasions and this, for her, makes them complete. Visitors to my showroom are most welcome but please contact beforehand. My inspiration and ideas come from landscape rocks and stones. I use various ways of making, sometimes combining thrown work and hand-building, then altering the form by squeezing and beating. I am interested in surface texture and use silicon carbide slips and oxides. 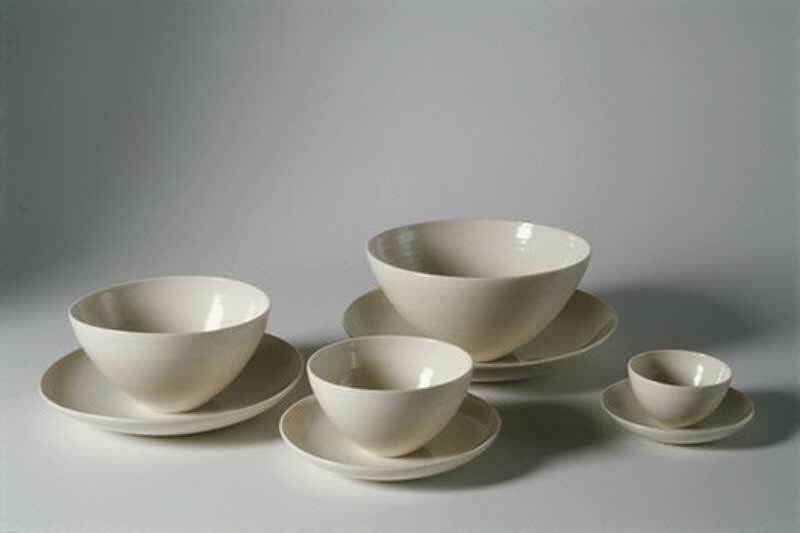 Glazes used mainly are feldspathic white and a dry white, fired to stoneware temperature 1240 degrees C in am electric kiln. I work from my studio in the garden of my house. 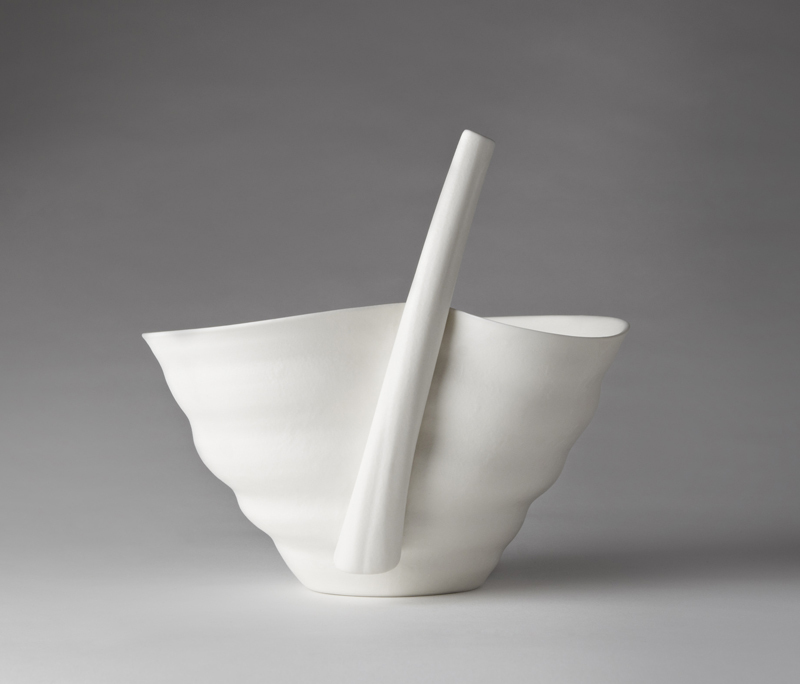 My porcelain forms are made on the wheel, the largest pieces are thrown in sections. 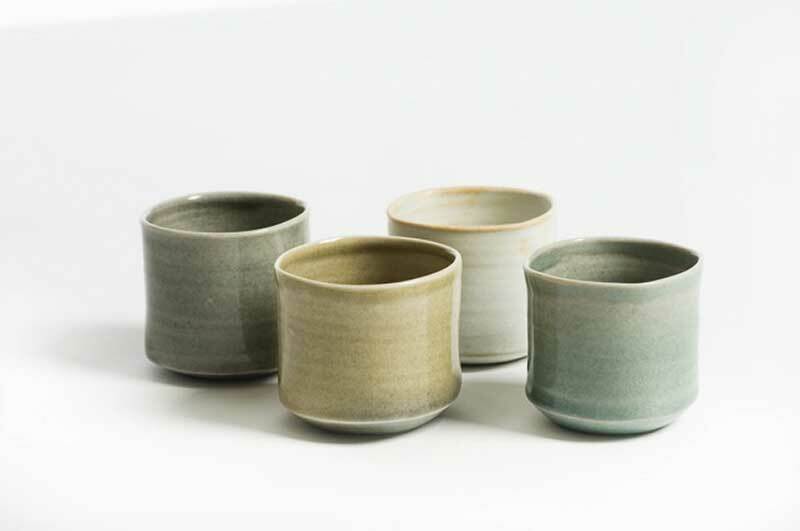 They are fired once, the colour and surface texture is a result of the interaction of sodium bicarbonate with the clay and slip during the firing. 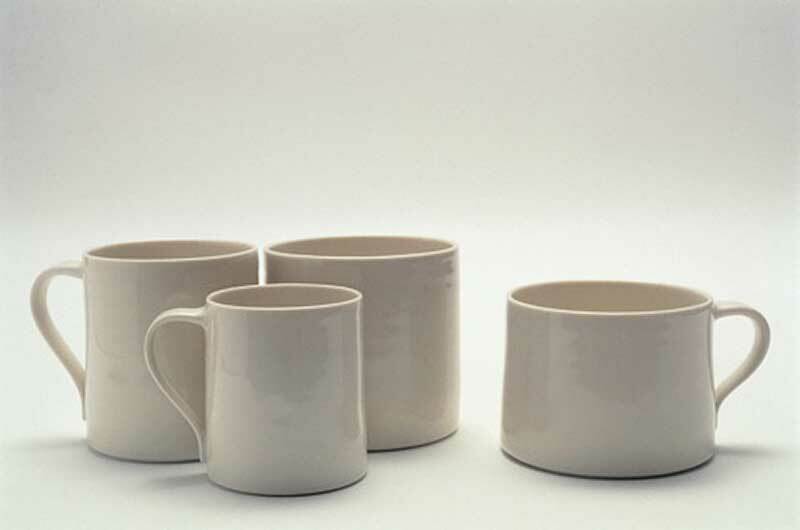 Karen Downing makes porcelain pots for everyday use: pots to be held, filled up, drunk out of, eaten from. 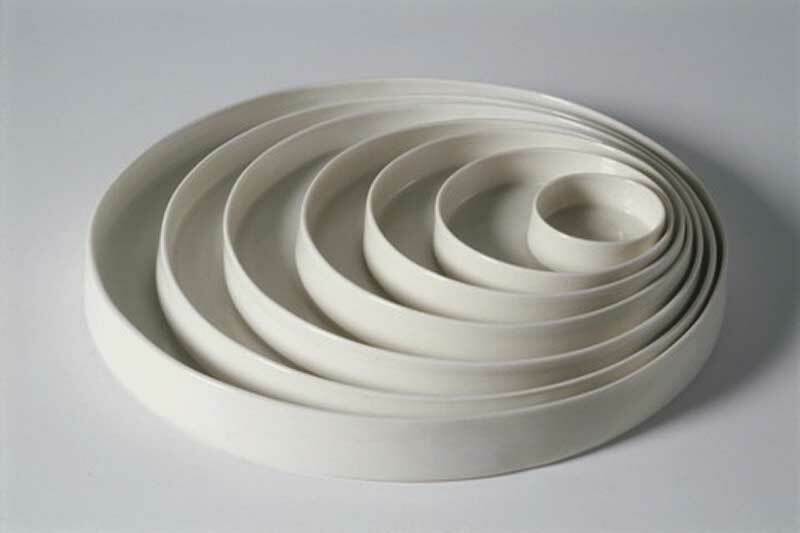 Her purposeful use of a porcelain clay body, a single creamy white glaze glaze, a deliberately restricted vocabulary of form and the process of repetition throwing combine to create unity and diversity in her work. Together these limited elements become a multitude of subtle variations that slowly evolve and are quietly, but constantly, refined and distilled. 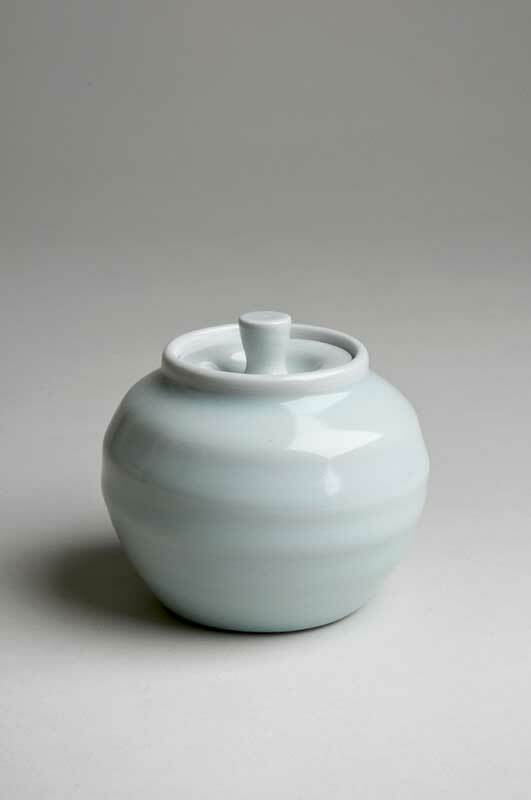 The pots are hand thrown and, although ‘repeats’ are thrown, the nature of porcelain, and of the throwing and firing processes, ensure that no two pots are ever exactly the same. 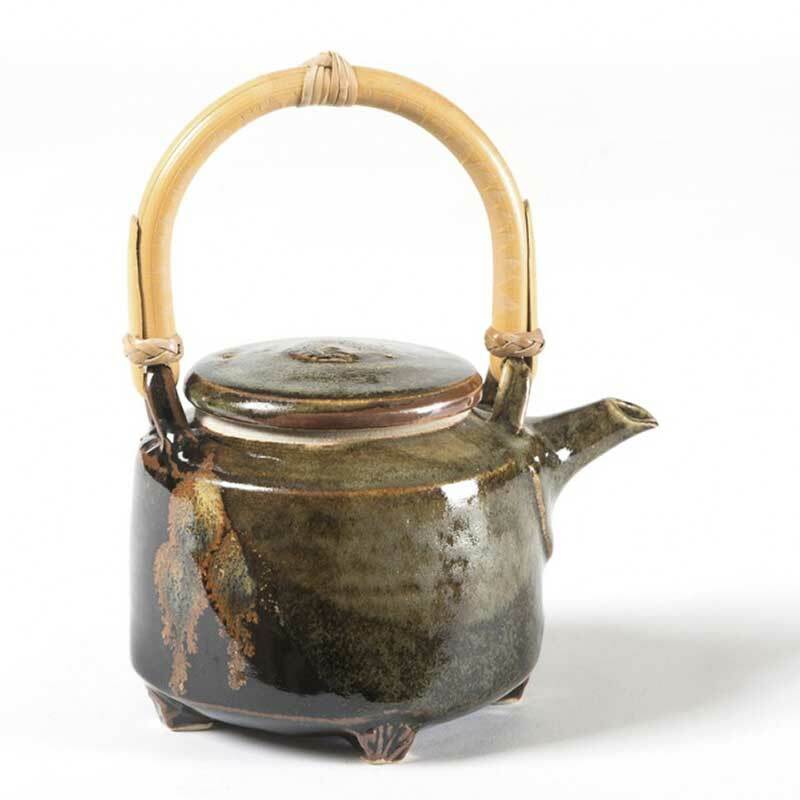 Subtle variations in size, form and glaze finish are inevitable, as well as desirable, and give each pot its own particular nuance and character. 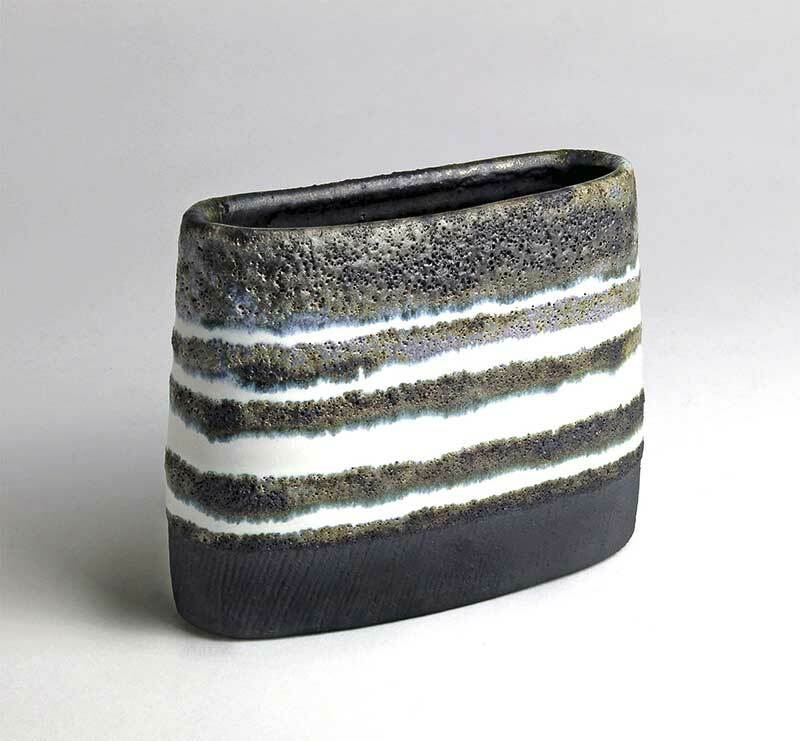 Karen gained a BA from Georgetown University in Washington, DC, served two apprenticeships with potters on the east coast of America and worked at Penland School of Crafts (North Carolina) before settling in the UK. 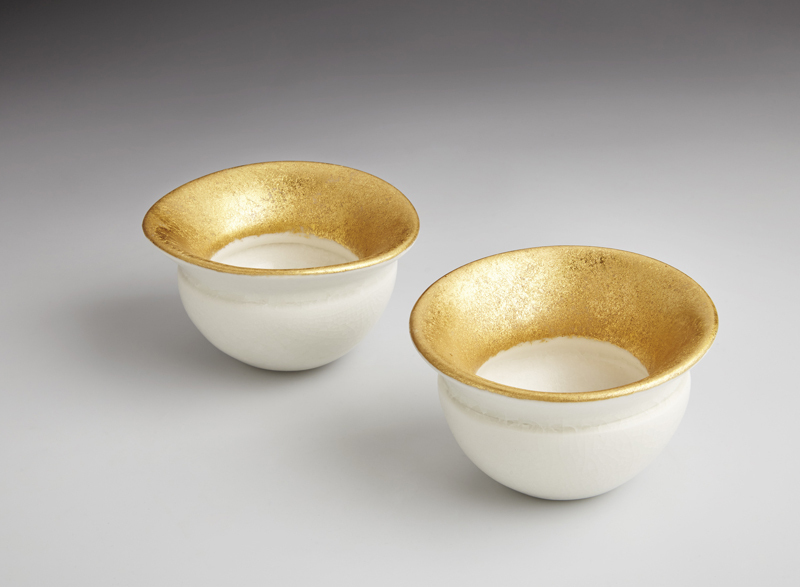 Her work has been widely exhibited in the UK and also in Europe, Japan and the USA. Karen Downing now lives and works in the Brecklands of Norfolk. Marks left on the landscape by ancient civilisations, the mysteries, the language, myths and legends, the mining history and the wild, dramatic and changing weather which has formed the barren moorland and rugged coast.. The work is an attempt to capture the essence of the area. 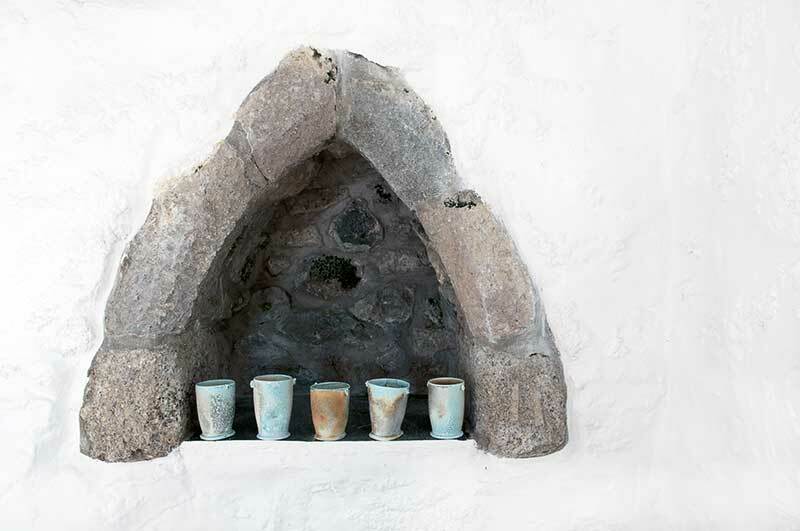 After completing a degree in ceramics at Cardiff in 1992, I returned to St Ives in Cornwall and set up my first pottery the following year. 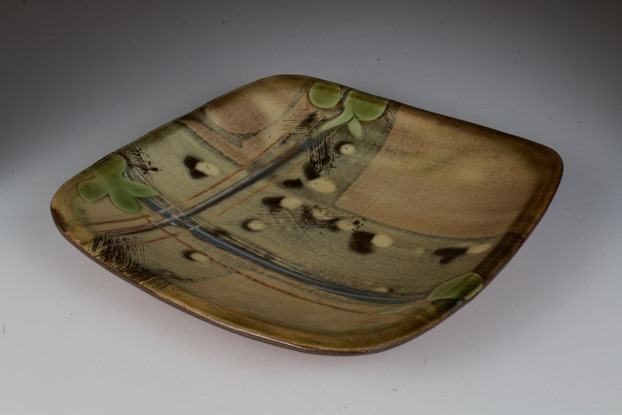 Since 2002 I have worked from the Gaolyard Studios, founded by former Leach potter John Bedding. Early in my student days I discovered slab building, and this has been my construction method ever since. 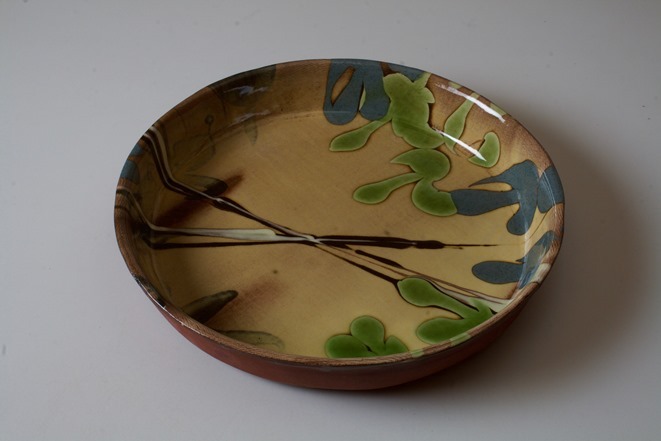 I use flat sheets of stoneware clay as a ‘canvas’, painting the surface with coloured slips. Then, working from images collected in my sketchbooks, I make intricate ‘fretwork’ transfers which are individually carved from a thin layer of porcelain slip painted onto newsprint paper. This is transferred to the prepared clay and the surface is worked on further with the decoration being completed while the slab is still flat. When the piece is constructed, there is a moment of magic as the composition, that felt right as a flat plane, is transformed when it becomes a vessel. 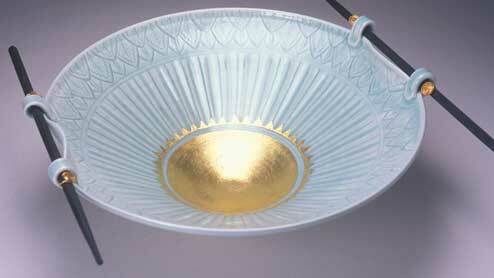 Joins are then left as raw seams and the surface is treated to create the final distinctive patina. 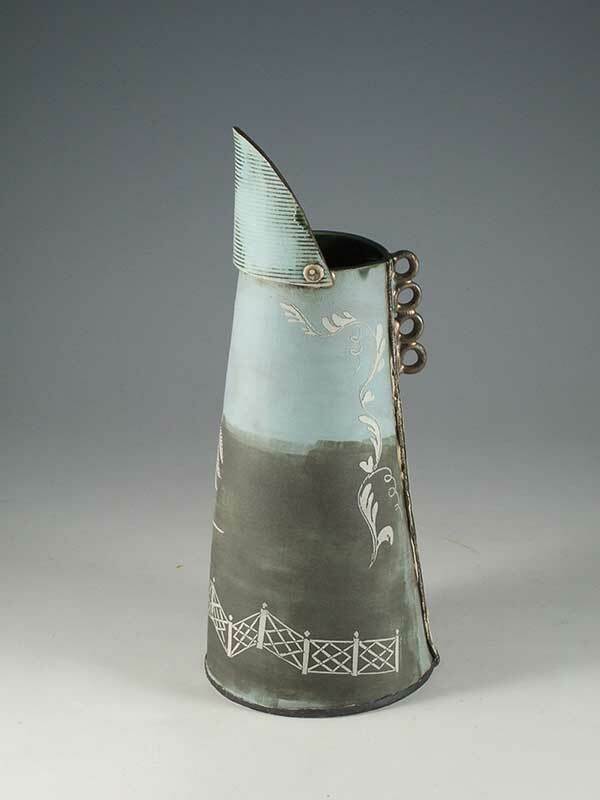 My work is stoneware fired in an electric kiln to 1220 degrees centigrade.